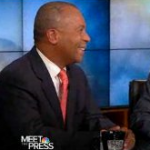 From Mediaite: Are you planning on tuning in to hear Herman Cain? According to a report, long-time conservative radio talker Neal Boortz will announce his retirement today and former GOP presidential candidate Herman Cain will replace him early next year. Reports Mediaite, “Radio Insight tweeted a cached page on Sunday night from WSB Radio.com dated 10:07 a.m. on Monday, June 4 that announces Boortz’s retirement after 42 years in talk radio. 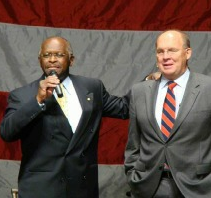 The story notes that former Republican presidential candidate and businessman Herman Cain will be taking over Boortz’s ‘200 radio stations with six million weekly listeners’ on January 18, 2013. Cain has joined Boortz regularly and already gives a daily commentary segment during the morning and evening drive-time rushes.” Read more about it here. From Gossip Cop: Nicki Minaj has cancelled a concert after being dissed by a host on the radio station sponsoring the event. Reports Gossip Cop, “Minaj was scheduled to headline Hot 97’s annual event in New Jersey, even hyping up her appearance on Twitter hours before she was slated to take the stage. That was until Hot 97 host Peter Rosenberg told the crowd, ‘I know there’s some chicks here waiting to sing ‘Starships’ later, I’m not talking to y’all right now. F**k that bulls**t. I’m here to talk about real hip-hop s**t.'” Lil’ Wayne, who controls Minaj’s Young Money label, heard of the comment and pulled the plug on her performance. Minaj deferred to Wayne’s judgment. Other Young Money artists, including DJ Khaled and Busta Rhymes, who were also slated to appear, bailed in similar fashions. Read more about the incident, including Rosenberg’s original comment here. 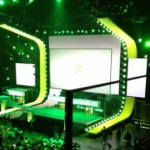 From Geekosystem: Today was the E3, or Electronic Entertainment Expo, an annual trade fair for the computer and video gaming industries. Reports Geekosystem, ” This year, Microsoft has made it clear they’re not pushing the aging Xbox 360 as only a “gaming device,” but as a “media console.” That’s not to say there aren’t some big games coming down the pipe, but a surprising amount of the announcements, like Internet Explorer for the Xbox (OH BOY!) andSmartGlass have little, if anything to do with gaming.” Geekosystem is updated with all the major announcements and developments, from Internet Explorer for XBOX to all the latest on games to new languages for Bing. Read the full breakdown here. From Styleite: A big announcement in the worlds of fashion and culture. Reports Styleite, “One of fashion’s most iconic designers is creating costumes for the New York City Ballet‘s Fall Gala in September, and we’ve got all the deets. Valentino Garavani will design costumes for three performances. According to the press release, these include “a new ballet set to selections from Tschaikovsky’s Eugene Onegin, and two rarely performed pieces d’occasion created for NYCB’s 1988 American Music Festival –- Sophisticated Lady… and Not My Girl, a pas de deux inspired by, and set to music composed by Fred Astaire. To top it all off, dancers will perform George Balanchine’s Rubies as a nod to Valentino’s signature red hue.” Wow. See a picture of Valentino at work and find a link for tickets here. From Sportsgrid: As the 2012 presidential election approaches, the political environment in our country is wrought with tension, especially apparent on cable television news. Reports Sportsgrid, “Americans at all points on the political spectrum constantly bemoan the perceived inability of politicians to work together to get things done. That’s made clear by Congress receiving a 79 percent disapproval rating in recent polls – and that number actually being an improvement. Disagreement’s only natural, of course – the two-party system exists to encourage different ideas and disagreement and the two sides will be forced to compromise to pass bills. And sometimes the calls for greater unity and compromise between the two sides are a little much – again, they’re supposed to disagree.But it’s hard sometimes not to wish for a less contentious political environment – and on Sunday, NBC’s Meet the Press might have discovered the secret.” And what is it? The Miami Heat. Read how here. 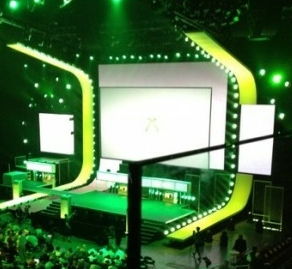 From The Mary Sue: Good news for gaming girls, but not from E3. Especially those with Playstation Vita. It was announced today that Assassin’s Creed III is set for release this October but the Playstation Vita is getting a different version called Assassin’s Creed 3: Liberation that features a female assassin named Aveline. Reports the Mary Sue, “The information was gleaned from the recent issue of Game Informer magazine. The user who sent in the information said, ‘the game is set in New Orleans between 1765 and 1780. Players take on the role of Aveline, a female Assassin. She’ll be mentored by Agate, an escaped slave. The weapons at her disposal include a machete, pistols and grenades.’ She’s said to be of mixed French and African descent. Now, Assassin’s Creed III is going to be set during the American Revolution and feature a man as usual. 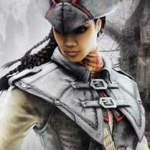 The new lead character is named Connor Kenway, but Liberation stars Aveline in the main role. ‘Because Liberation takes place in the same general time period as AC3, story connections are inevitable,’ writes Cinema Blend. 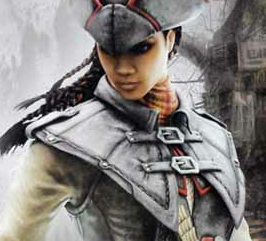 ‘At some point in the game, Aveline will cross paths with AC3‘s protagonist Connor. Desmond’s story isn’t related, though. Instead, someone else is using the Animus. '” Read more about the game, the protagonist, and the writer’s opening here. From The Jane Dough: The Miss USA pageant happened last night, and Jane Dough writer Amy Tennery has a thing or two to say about it. Writes Tennery, “On a scale of Things I’d Like To Be Doing, competing in a pageant falls somewhere between jamming a fork in an electrical socket and raising a hive of hyper-intelligent mosquitos in a studio apartment. I say this as a kind of disclosure, in the spirit of fairness — pageants just aren’t my thing. Even so, I have a proposal: Let’s get rid of the Miss USA pageant. It’s time. …If there were ever a time to call it, I think this is it. The Miss USA competition is vapid, sexist and it needs to stop. I know I’m not blowing any minds here but, just in case, let’s establish it anyway: No one’s winning the Miss USA pageant for reading the complete works of Tolstoy, if you catch my drift. I’m not calling anyone dumb — in fact, I’d venture to guess it takes Herculean levels of mental stability to stand on a stage in a bikini on live television and not come completely unhinged. I wouldn’t know, but I think that’s a fair assumption. These are reasonably smart people — college students, musicians and, on occasion, rhythmic gymnasts. They’re also a crop of women who’ve systematically learned to value looks over everything else. Do we really still need to establish that this is terrible? Apparently.” Read more of Tennery’s opinion here. 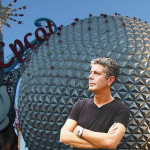 From The Braiser: It was recently announced that Anthony Bourdain is taking his talents to CNN. What does that mean for his foodie followers? Reports The Braiser, “As he wrapped up filming the last episode ever of No Reservations last week, Anthony Bourdain tweeted one of the reasons he’s joined CNN, and it’s not so that he can become the latest hologram in their celebrity collection: ‘We are all assuming a worldwide news organization can get us into locales we otherwise might have problems with.’ Oh man! Does this mean that Bourdain is donning a khaki vest with multiple pockets and a neckerchief to go to the most dangerous places on Earth? We don’t know what that will mean for the CNN version of No Reservations, but we do know that CNN can send its correspondents anywhere. 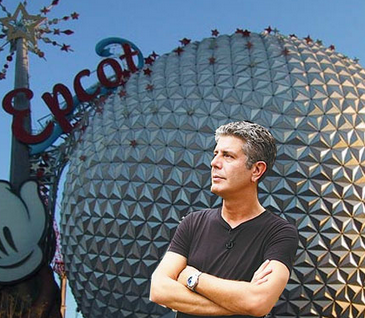 Seriously: ANYWHERE.” The Braiser offers their list of the seventeen places they would like to see Bourdain travel, from Baghdad to Disneyworld. Read the full list here.